The Difficulties in Emotion Regulation Scale (DERS) is a widely-used, theoretically-driven, and psychometrically-sound self-report measure of emotion regulation difficulties. However, at 36-items, the DERS may be challenging to administer in some situations or settings (e.g., in the course of patient care or large-scale epidemiological studies). Consequently, there is a need for a briefer version of the DERS. The goal of the present studies was to develop and evaluate a 16-item version of the DERS – the DERS-16. The reliability and validity of the DERS-16 were examined in a clinical sample (N = 96) and two large community samples (Ns = 102 and 482). 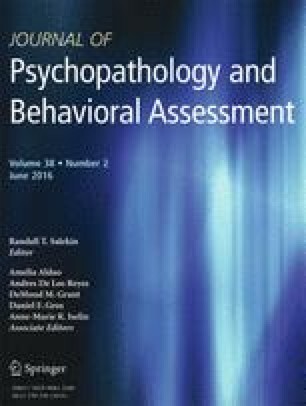 The validity of the DERS-16 was evaluated comparing the relative strength of the association of the two versions of the DERS with measures of emotion regulation and related constructs, psychopathology, and clinically-relevant behaviors theorized to stem from emotion regulation deficits. Results demonstrate that the DERS-16 has retained excellent internal consistency, good test-retest reliability, and good convergent and discriminant validity. Further, the DERS-16 showed minimal differences in its convergent and discriminant validity with relevant measures when compared to the original DERS. In conclusion, the DERS-16 offers a valid and brief method for the assessment of overall emotion regulation difficulties. This research was supported by National Institute of Child Health and Human Development Grant R01 HD062226, awarded to the eighth author (DD). Additional funding was provided by the Stockholm County Council (ALF project; grant number: 20140428) and the Fredrik och Ingrid Thurings stiftelse. All study procedures were approved by the appropriate institutional review committee and meet the guidelines of the responsible government agency. Written informed consent was obtained for all participants prior to participation. Please indicate how often the following statements apply to you by writing the appropriate number from the scale above (1–5) on the line beside each item. CLARITY = Lack of Emotional Clarity; GOALS = Difficulties Engaging in Goal-Directed Behavior; IMPULSE = Impulse Control Difficulties; STRATEGIES = Limited Access to Effective Emotion Regulation Strategies; NONACCEPTANCE = Nonacceptance of Emotional Responses.